Thomas Township is located in the heart of Michigan's fastest growing region. The State of Michigan is a state blessed with the riches of unspoiled nature: the world's longest freshwater coastline, lakes that feel like oceans, shimmering beaches, miles and miles of cherry orchards, glorious sunrises and sunsets, daytime skies of the deepest blue, nighttime skies scattered with stars. Home to more than 100 public beaches, some of the highest freshwater sand dunes in the world, stunning multi-colored sandstone cliffs, two National Lakeshores and the only national marine sanctuary in the Great Lakes--the Thunder Bay National Marine Sanctuary in Lake Huron. More than 100 lighthouses, numerous maritime museums, ten shipwreck-diving preserves and historic military fortifications rim Michigan's Great Lakes shoreline. Lakes, campgrounds, wildlife refuges and 99 Michigan state parks and recreation areas create a wide variety of recreational pursuits. Rivers for water sports, and thousands of miles of hiking, biking, cross-country skiing and snowmobiling trails thread their way among some 100 species of trees. Long days, relaxing weather and more than 800 pristine Michigan courses make for the perfect tee time. Because being able to play all day is Pure Michigan. Hundreds of islands dot Michigan waters. Isle Royale National Park is a remote wilderness retreat in Lake Superior where wolves and moose roam free. 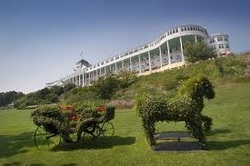 Mackinac Island, located in the Straits of Mackinac, is a lush 19th-century resort community fixed firmly in the Victorian era, a car-free island dominated by an 18th-century fort and the more than a century-old Grand Hotel, America's largest summer resort hotel. The State of Michigan offers a near infinite array of moments that live forever in memory. Come find out what Pure Michigan feels like. Abundant Talent: Talent is the first thing we're asked about and we have it: The University of Michigan is the No. 1 ranked Public University in North America (World University Rankings, 2010-11), our state produces more engineers than all but two mega-states, we are one of the top four states for tech workers and are a leader in advanced manufacturing. Our economy is growing so we're seeking even more talent through initiatives like MichAgain and Global Michigan. The MEDC has made Talent and Economic Gardening two of its main missions, one of the few states to do so. Lower taxes, lower costs: Governor Rick Snyder’s new tax plan cuts or eliminates business taxes for most businesses with corporations paying a flat 6% tax, the most competitive in the Midwest and among the best in the nation. 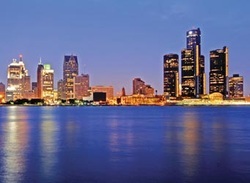 Already Michigan real estate and costs of living and doing business are very low. We make things: $16.7 billion in annual industrial R&D: Besides being one of the top states in the nation for industrial R&D, Michigan universities did more than 1.7 billion in R&D in 2009. Michigan's University Research Corridor (begun by Michigan State University, the University of Michigan and Wayne State University) rivals nationally known innovation clusters like the Research Triangle and Silicon Valley. Our entrepreneurial and manufacturing prowess is in our DNA (reflected in the names of major foundations started by Michigan business legends like Ford, Kellogg, Kresge and Mott).